Have you always admired the look of lofts but have not had the pleasure of living in one? Are you a fan of exposed piping, yet can still enjoy modern day finishes like drywall? 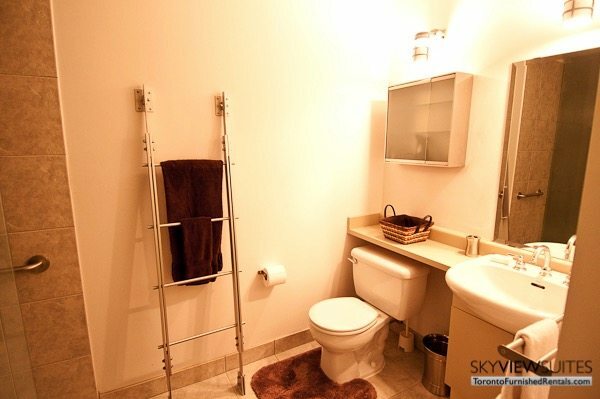 Did you worry that you were not going to be able to find these features in Toronto short term apartments? Guess what? That’s not true! No need to bring your palm to your forehead, you can still come here and stay. This historical landmark of a building houses a collection of changed loft styles, fashioned by 3 teams of interior designers who are world renowned. The groups have produced a project with adequate variety to suit any urban lifestyle. Look up, but don’t hurt your neck, what you’re looking at is 12 foot high ceilings. The kitchen has been custom designed and carries top of the line stainless steel appliances, and granite countertops. As a complete suite, you will notice the very airy and open feel it possesses; there is a dining table which can seat four comfortably, and six in a squeeze. The living room area is behind that with a welcoming couch and a flat screen digital TV. Hardwood floors that are European beech strip flow throughout the main living area. 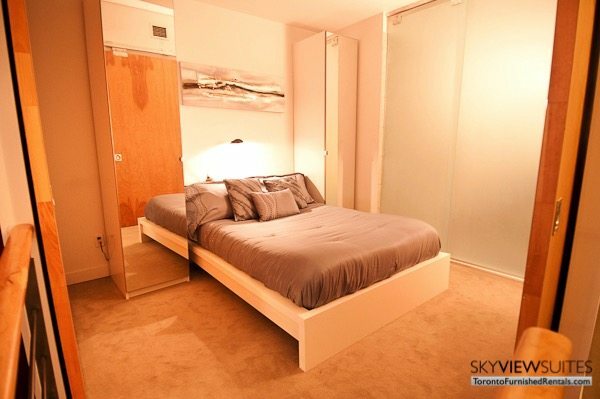 Carpet is located in the bedroom; there are solid maple barn doors that enclose the bedroom off, making it private. There is a queen sized bed in there and a solid wood dresser for clothes storage. 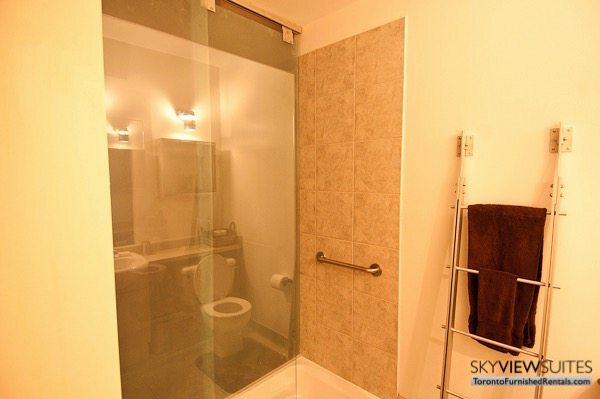 The bathroom is classic and has a stand up shower with glass enclosure. Moreover, the building has an inspiring rooftop garden and seating area, a lap pool and barbecue terrace with panoramic views of the lake and downtown Toronto. An abundance of recreation facilities are available, consisting of a huge basketball court and fully functioning fitness facility. Additionally, there is a games room which holds a pool table, foosball table, air hockey and a ping pong table. The lobby is remarkable, it’s outfitted with relaxing chairs and couches, a piano, and it could be an ideal place for meetings. 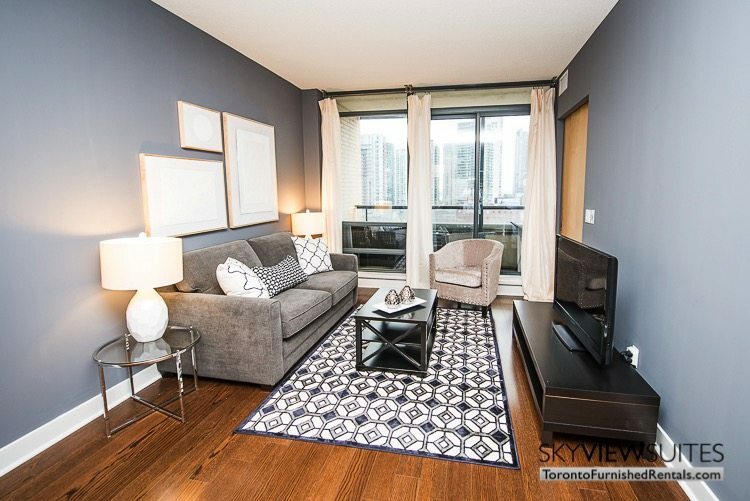 For more information on this and other Toronto furnished short term rentals, click here: Furnished Rentals.